In the 2013 season Tiger Woods won five tournaments of 16 starts on the PGA Tour, including two WGCs and top 10s at Augusta and Muirfield. Now we are all starting to get excited about a tie for 32nd at The Greenbrier. Rounds of 66-69-71-67, the 67 his first bogey-free round in his last 56 outings, have given more cause for optimism than anything we’ve seen so far this season. At Augusta he was T17 but hit only two fairways in his closing 73. Now, after the early season bout of shambolic chipping, the putter just needs to warm up to be properly competitive. The swing changes, he insisted, were put in place at the Memorial, where he had a third-round 85. "I made a big, giant step at Memorial," he said. "The pattern was set. I just had to refine it. This week we did that. We definitely refined it. I was excited about what I was able to do at Memorial, even though I shot those high numbers, shifting the baseline like I did. The 39-year-old only needed 25 putts on Thursday, thereafter there were 32, 31 and 31. "This could have been one of those special rounds. It's the best I've hit it in a very long time. I had full control over all clubs. I just need to make some putts. 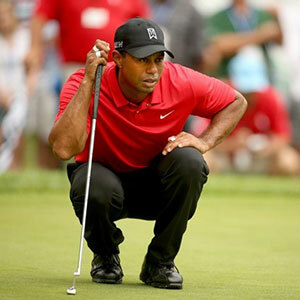 The putts that I read perfectly, I hit right, they still lipped out." Next stop is St Andrews, home to two of his three Open victories. When asked if he had built up some momentum ahead of the Open Championship, Tiger said: “Absolutely, absolutely.